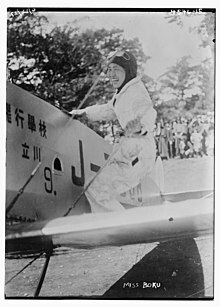 Park in 1927 as "Miss Boku"
Park Kyung-won (24 June 1901 – 7 August 1933) was, along with Kwon Ki-ok of the Republic of China Air Force, one of the earliest Korean female aviators. Though it is generally agreed that Kwon was the first female pilot, Park is still recognised as the first Korean female civilian pilot, as Kwon was trained by the Republic of China Air Force. She was the subject of the controversial 2005 South Korean film Blue Swallow, in which she was portrayed by actress Jang Jin-young. Park was born in Daegu, Gyeongsang-do, Korea. From 1912 to 1916, she attended Daegu's Myeongsin Women's School, a Presbyterian missionary school operated by Americans; a year after her graduation, on 13 September 1917, she departed her hometown for Japan. Upon her arrival in Japan, she initially settled in Yokohama's Minamiyoshida-machi, where she enrolled in the Kasahara Industrial Training School, spending two and a half years. From 1919, she began attending a Korean church in Yokohama, and later converted to Christianity. In February 1920, she returned to Daegu to enter a nursing school there; though her true aim was to become a pilot, she needed to earn money for the tuition fees first. In January 1925, Park returned to Japan, where she finally enrolled in an aviation school in Kamata (present-day Ōta, Tokyo). She had initially hoped to attend the same flight school as An Chang-nam, the first Korean male pilot, but it had burned down in 1923. She graduated and took the test for her third-class pilot's licence on 25 January 1927; she obtained the licence three days later. On 30 July of the following year, she obtained her second-class pilot's licence. On 4 May 1933, Park was chosen to fly on a new route between Japan and Manchukuo. She flew to Seoul on 19 May to meet with government officials there. At 10:35 AM on 7 August 1933, she took off in her Salmson 2A2 biplane, named the Blue Swallow, from Tokyo's Haneda Airport on one such flight to Manchuria; she crashed 42 minutes later near Hakone, Kanagawa and died. ^ a b c d "映画『青燕』、韓国初の女性飛行士めぐり論争 (Movie 'Blue Swallow' and the debate about Korea's first female aviator)". Chosun Online. 2005-10-16. Archived from the original on 2007-09-30. Retrieved 2007-05-22. ^ Kim, Tae-jong (2006-02-22). "'Blue Swallow' faces turbulence". Korea Times. Retrieved 2007-05-20. ^ a b c "우리나라 최초의 여류 비행사 박경원 (Our country's first female pilot, Park Kyung-won)". Arirang News. 1999-12-25. Archived from the original on January 18, 2006. Retrieved 2007-05-23. ^ Pae-yong Yi (2008). Women in Korean History. Ewha Womans University Press. p. 230. ISBN 9788973007721. ^ Jeong, Hye-ju (2005-05-19). "제국주의의 치어걸, 누가 미화하는가 (Who will try to glorify the cheerleader for imperialism?)". OhmyNews. Retrieved 2007-05-24. Kanō, Makiyo (January 1994). 越えられなかった海峡―女性飛行士朴敬元の生涯 (Impassable Straits: The life of female pilot Park Kyung-won). Jiji Tsūshin. ISBN 4788794039. This page was last edited on 12 March 2018, at 19:55 (UTC).